Bioymifi is an DR5 activator (Kd = 1.2 µM; IC50 = 2 µM). Bioymifi induces apoptosis via the Tumor necrosis factor (TNF)-related apoptosis-inducing ligand (TRAIL) death receptor DR5 independent of TRAIL. Bioymifi can act as a single agent to induce DR5 clustering and aggregation, leading to apoptosis. Tumor necrosis factor (TNF)-related apoptosis-inducing ligand (TRAIL) activates apoptosis through the death receptors DR4 and DR5.
. Wang G, et al. 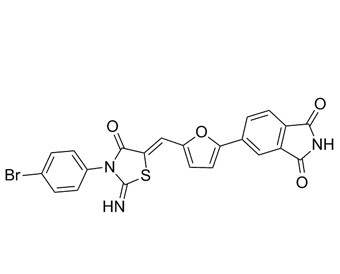 Small-molecule activation of the TRAIL receptor DR5 in human cancer cells. Nat Chem Biol. 2013 Feb;9(2):84-9.